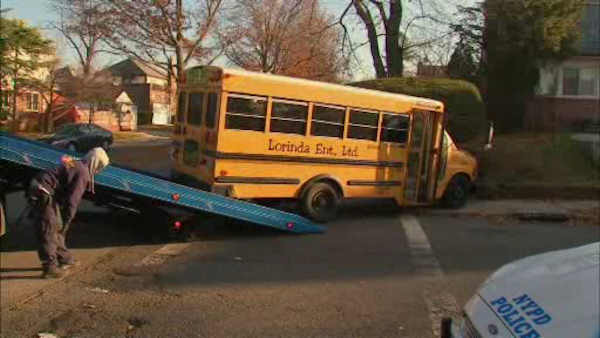 FRESH MEADOWS, Queens (WABC) -- A mini school bus jumped a curb in a crash in Fresh Meadows, Queens, Monday morning. The school bus is believed to have collided with another vehicle at the intersection of 75th Avenue and 181st Street just after 7:30 a.m. Officials say the driver of the SUV failed to stop at the stop sign, causing the crash The driver was summonsed for disobeying a stop sign, and for driving without a valid license. Six children with special needs and two adults were taken to Long Island Jewish Medical Center with minor injuries. The Education Department said families have been notified and the department will continue to provide ongoing support.